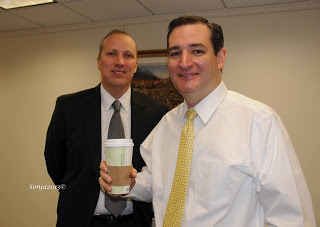 On January 22, 2013 my husband, Bill and I attended a Texas Tuesday Coffee in a senate meeting room in the US Capitol. The TTC was hosted by our US senators John Cornyn and Ted Cruz. 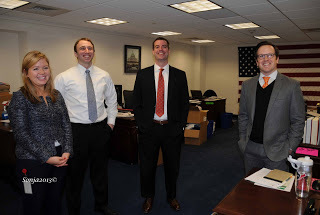 Our visit began at the Capitol Visitors Center where we went through security procedures and obtained our day passes. 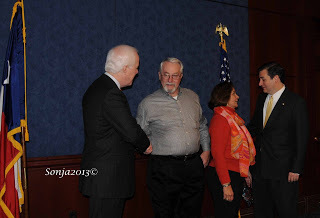 Senator Cornyn shared a conference room with Senator Cruz to ‘Meet and Greet’ visitors from all over Texas. We entered a large room with only a few chairs for sitting. Orange juice and coffee were provided. I have never attended a TTC so I really did not know what to expect. I was pleasantly surprised that a photo was taken by a staff photographer and at some time will be mailed to our home. What I did expect was a ‘Welcome to DC’ speech by Senator Cornyn to all those in attendance. Instead Senator Cornyn and Senator Cruz attempted to meet as many as possible by reaching out to shake hands. There were mostly young people from different schools and the photographs were taken as group pictures. Following the morning reception, we were in for another treat, a visit with Senator Cruz in his office. I had often wondered how senators got around from building to building and we found out because we took the tram that moves underground from the Capitol to the office buildings. The tram is something similar to the metro in DC but with seating for about four people. 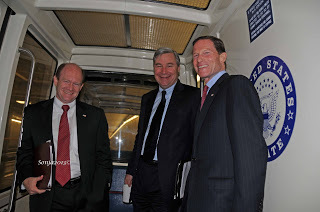 When we entered the tram there were three Democrat senators discussing whatever Democrats talk about. 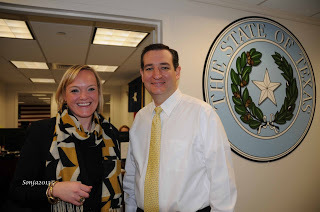 But they were cordial and smiled even after I told them we were from Texas visiting Senator Cruz. 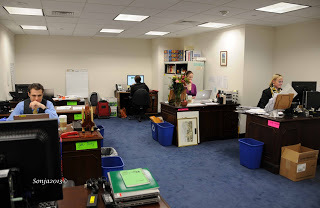 We found Senator Cruz office in the basement of the Dirksen Senate Office Building, Suite SDB-40B. There were many different questions that raced through my mind to ask our Senator. So I thought since he had been very busy returning from Afghanistan, moving into his temporary office, staffing his office, and in a whirlwind of TV shows expressing his views on many different issues affecting all Americans, appointment of Chuck Hagel, the Debt Ceiling and the out of control spending, gun control and immigration, I would take a more relaxed approach to my visit. I decided that a tour of his office would be just the thing to do because of the circumstances. It would also give me an opportunity to personally meet his staff. Bill signed the guest register at the front desk and we were greeted by a friendly face Nick Dryer. We met and had already spoken to his Chief of Staff, Chip Roy earlier at the TTC so we were expected. We found Chip to be welcoming and interested in our visit. He also explained that Cruz had been extremely busy making appearances on TV shows like Meet the Press and Fox News with Chris Wallace, conveying his views to the public on current issues. In case you missed any of these appearances and statements on current issues you can go to his website and watch the videos for yourself. In my opinion, Cruz is doing the right thing being in front of the TV audiences getting his conservative message across to all Americans. We all know how biased the media is so this exposure is extremely good for all Republicans. Because Cruz is so articulate and knowledgeable, it is very difficult for the TV hosts, the mimes as I call them, to get the best of him. 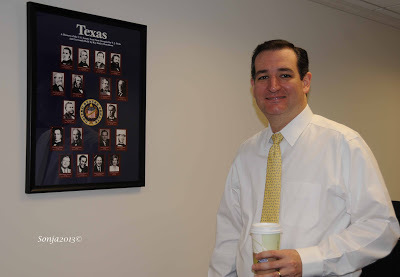 Senator Cruz made it a point that we see the framed poster with all the previous US Texas senator portraits that have gone before him in Class 1. Senator John Cornyn is in Class 2. 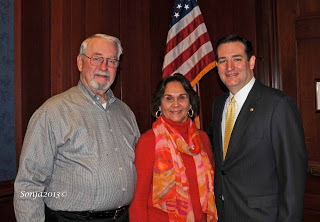 Cruz now occupies the seat that Kay B. Hutchinson vacated when she retired after 20 years of dedicated service. Only one other Republican besides Hutchinson and Cruz, James Flanagan, from March 1870 to March 1875 held a Republican senate seat in Class 1, all others, 16, were Democrats. 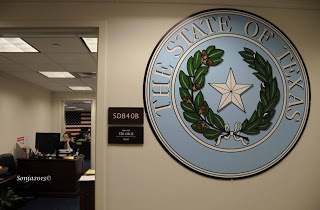 See the list of US senators from Texas. I have no doubt that he will make us very proud that he is our Republican US Senator from Texas. 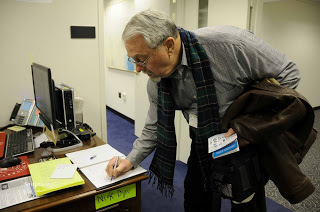 Like the picture denotes, Roy stays in the background assisting the senator. I first met Dougie Simmons over the phone making arrangements for our visit. I found out that the scheduling had to be on hold until after Senator Cruz returned from his trip to Afghanistan for security reasons. I was not made aware of his visit to Afghanistan until he returned, and I am sure there was a lot for him to do upon his arrival. Dougie’s job is of the upmost importance because she keeps the scheduling book and she tells the senator where he has to be. She certainly has the right personality in dealing with his constituents. His staff seemed to be working at their duties and happy to be on board. They were friendly and courteous when Senator Cruz introduced us. The office is still not fully manned or are all the boxes unpacked but his staff members made us feel welcome…a Texas welcome. Senator Cruz will move to his final office sometime in May after all the shuffling is completed and the new assignments are made. I have worked with Ted for well over a year in Comal and Bexar counties by blogging and doing the ‘candidate stuff’ like delivering yard signs and hosting our clubs fundraiser with Ted as our keynote speaker. We were also invited to be in two of his TV campaign ads, and I can personally tell you that he is noticeably more relaxed since he won the hotly contested ‘run off’ in July. Senator Cruz parting remark was, “I won’t forget that I have 26 million bosses in Texas.” He truly believes that grassroots matter.